In 1965, a small number of students in Des Moines, Iowa, planned to wear black armbands to protest and mourn the Vietnam War. School officials learned of the planned protest ahead of time and hurriedly passed a rule banning the wearing of such armbands. 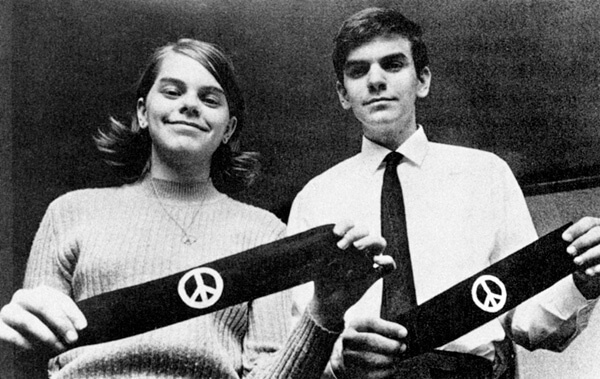 The students, among whom were brother and sister John and Mary Beth Tinker, went ahead with their peaceful symbolic expression against the war—and the school suspended them. Aided by the Iowa Civil Liberties Union, the Tinkers sued the school for violating their First Amendment free-speech rights. Although they lost their case in federal district court, they eventually appealed to the Supreme Court, where they prevailed by a 7–2 decision. Since 1969, because of the Tinker decision, school officials, in order to prohibit any free-speech expression initiated by a student, have had to show reasonable cause that it would result in “substantial disruption” of, or “material interference” in, school activities or infringe on other students’ rights. Tinker has been applied to numerous situations over the past fifty years. The Supreme Court decisions Hazelwood School District v. Kuhlmeier, Bethel School District No. 403 v. Fraser, and Morse v. Frederick in particular have modified Tinker. Some limits have been allowed on students’ expression, such as when it is school-sponsored; if it is considered lewd, vulgar, or plainly offensive; or if it promotes illegal drug use. Website of advocacy organization that supports First Amendment rights for students and teachers, founded by one of the co-petitioners in the Tinker v. Des Moines case. Opinion piece by the online education and outreach partner of the Freedom Forum and the Newseum. Background on the impact and legacy of the Tinker case. An hour-long presentation and discussion with Mary Beth Tinker and John Tinker, hosted by Iowa Public Television. A look at John Tinker, who will keynote the We The People National Finals on April 29.